I know what you’re thinking: damn, another article offering alternatives to Google Inbox. Well, this time we tried to understand first what the users liked the most about Inbox before talking about any alternatives. We have digged over 100 Google Inbox user comments on the Google Play platform. We have discovered that the email bundling, email snoozing, reminders creation, to-do list experience and the email pinning are the top 5 features of Google Inbox. In fact, we were a bit surprized as we expected to find at the top of the ranking Highlights and Smart Replies. In particular, we found out that bundling email — whether it’s auto or manual — is one of the most requested features. It has even been confirmed by Google that had previously shown in a study that 85% of messages were bundled and that 60% of the users swept away bundles twice a day. Now that Google Inbox is shutting down, let’s see what are the best apps for each of the top 5 features. Google quickly realized that snoozing was a very popular feature to manage emails. That is why they decided to bring the snooze feature into Gmail last year in order to stick to new efficient ways of processing emails. Whether you’re on the Gmail web-app or on your Gmail mobile app, you can now have Gmail temporarily remove emails from your inbox until you need them. The experience is really simple and fast. As you remember, Google Inbox intelligently sorted messages into categories like “Purchases,” “Finances,” and “Low Priority” and then presented those messages as bundles within your inbox. Well, bad news: right now, there’s no great way to emulate bundles within Gmail. Good news: the bundling feature is rebuilt with Gwapit and you will even be offered bundles that are specific to your job. It is even possible to bundle comments or messages coming from applications like Slack or Jira and to be provided with business oriented bundles. For instance, the bundle “Mentions” automatically groups all the messages in which you have been mentioned, whether it was on Slack, Jira, Confluence or Trello. The only difference is that we call it “Topic”. What we also loved about Google Inbox was the fact that it turned your email into tasks. Sadly, the new Gmail is quite classic and offers a more standard view. For those who liked to process a mailbox like a to-do list, you can install the chrome extension Drag app. It instantly turns Gmail into a Kanban layout (they call them boards) to help the sales & support teams better organize their collaborative inbox. Pinning messages and reminders in Google Inbox used to place specific emails on your main inbox screen, keeping your most important messages at your fingertips. 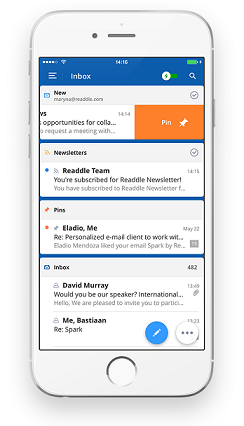 Spark is an email app that provides you with follow up reminders that help you keep track of emails you send that don’t get a reply within a certain period of time. With Google Inbox, pinning was the equivalent of marking an email as important. You can find this feature with Spark by tapping the pin button above the message details. Pinned emails will appear at the top of your Inbox, and are also available as a Sidebar item and/or Widget. Of course, each of these apps have a lot more to offer — especially Gmail with IFTTT integrations and the use of shortcuts — but after trying them, we wanted to focus on THE feature that made them great. The reasons to kill Inbox are numerous: 1 email system is better than 2, more people use Gmail than Inbox, Gmail is close enough now to Inbox in interface and features, etc. What Google seems to forget is that this innovative alternative brought together all the most active and engaged Gmail users. Engaged users are willing to give feedback and therefore are far more valuable to Google than indifferent users. And every innovative company can not afford to lose its own innovators. As Mike Elgan would say, “if it keeps this up, its most passionate users are going to take their passion somewhere else”.